When Jesus Christ was on the earth, He taught through example that we must all be baptized. Some people may wonder if baptism is still important in modern times. Through the biblical account of Jesus Christ’s baptism, we learn that baptism is an essential part of our loving Heavenly Father’s plan for all His children. Jesus Christ was the only perfect person to ever live on the earth (see True to the Faith , 14–21). He never committed sin. Jesus lived a perfect life to show us how to live so that we can return to our Heavenly Father after we die. Even though He had no sins to be forgiven of, Jesus Christ chose to be baptized to set a perfect example for us to follow (see Matthew 3:13–15). What happened at Jesus Christ’s baptism? The Bible teaches us that Jesus was baptized by His cousin, John the Baptist (see Matthew 3:13). 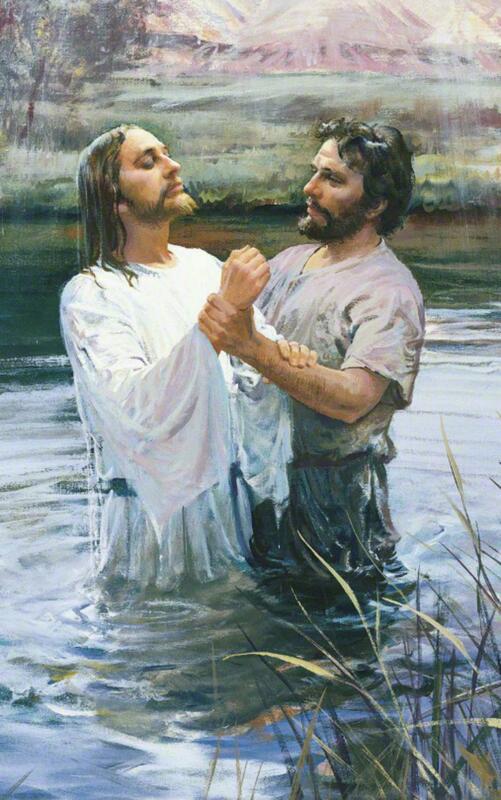 God gave John special power and authority to baptize (see Guide to the Scriptures, “John the Baptist,” scriptures.lds.org). We call this power and authority to baptize the priesthood. Today, the only church that has the same authority to baptize as John had is The Church of Jesus Christ of Latter-day Saints (to learn more about The Church of Jesus Christ of Latter-day Saints, visit ChurchofJesusChrist.org or mormon.org). At Jesus Christ’s baptism in the Jordan River (see Mark 1:9), God the Father spoke from heaven. God said that He was “well pleased” with Jesus (see Matthew 3:17). God is also pleased with us when we choose to be baptized, because when we are baptized, we show through our actions that we love Him and want to follow Jesus Christ. The Holy Spirit was also present at Jesus Christ’s baptism (see Matthew 3:16). When we are baptized, we too can be given the gift of the Holy Ghost. This special gift allows the Holy Ghost to guide and help us. It also allows us to feel more of God’s love in our lives. If we choose to be baptized and live righteously, the Holy Ghost can always be present in our lives. Why does Jesus Christ’s baptism matter for you? Each of us must be baptized to return to live with God someday. To learn more about the life of Jesus Christ and how you can be baptized, visit ChurchofJesusChrist.org.